Today was, without any doubt, one of the most important stops on our “Cruising to the Cyclades” itinerary. We visited just one place, a tiny little barren island, but that island is Delos. Measuring only five by 1.3 kilometres (3.1 by 0.8 miles), virtually devoid of water and thus not exactly verdant with fertility, Delos is one of the most celebrated archaeological sites in the world and one of the most extensive excavations in Greece, listed by UNESCO as World Heritage since 1990. Virtually the entire islet is covered in ancient remains, of shrines, temples, altars, streets, houses, a theatre, a stadium and so on, as well as countless bases for statues in stone and metal, most of which are now lost. The reason for the extraordinary archaeological density of Delos is a very specific one. Since the 10th century BC (or perhaps even since the 13th century BC), the island was considered the birthplace of Apollo, the god of light, order and reason, and his twin sister Artemis. As such, it attracted pious visitors from throughout the Greek World, as well as rich dedications of portable objects, sculptures and even buildings, all to honour Apollo. The ancient Greeks actually perceived Delos as the centre of the Cyclades, said to be arranged in a circle (Greek kyklos, thus Cyclades) around it. 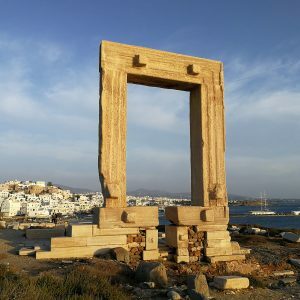 In the sixth century BC, the neighbouring city-state of Naxos played a leading role in embellishing the Delian shrines, superseded in the fifth century by Athens, which made the island the nominal headquarters of the “Delian League”, the Athenian-dominated military alliance that was to become the de-facto Athenian Empire. Delos was the seat of the League’s treasury from 479 to 454 BC, before it was moved to the Parthenon on the Athenian Acropolis. After the downfall of Athens as a leading power, new political entities, the great Hellenistic kingdoms, continued to favour Delos, which now also enjoyed a pivotal geopolitical position, located at the centre of the Aegean and between the different major powers. In the third and second centuries BC, Delos was the most important centre of trade and exchange in the Mediterranean, home to an astonishingly rich city inhabited by affluent merchants from Greece, Italy, the Middle East and beyond, being privileged by the rising Roman Republic as a “free port”. 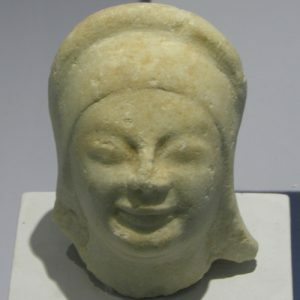 The island’s fortunes changed in the first century BC. Two pirate raids in 88 BC and 69 BC ravaged the city and sanctuary, and the changing political boundaries, reducing Delos to a backwater within the Roman Empire, prevented any serious recovery. We spent the entire morning on Delos, showing our guests as much of the place as we could, both in the sanctuary area and in the wonderfully well-preserved residential quarters of the Hellenistic era. For the first two hours or so, we were the only people on the island – it was beautiful. I cannot possibly list all the things we saw on the site and in the site museum, but for today’s picture I have chosen the famous Terrace of the Lions. Five marble lions are set in a row, overlooking the area of the (former) Sacred Lake, the very birthplace of Apollo and Artemis. Since 2000, the original sculptures are in the local museum, protected from weathering, replaced by replicas in their findspots. A sixth one, clearly from the same series, has somehow ended up in Venice, and a careful count of fragments found on Delos indicates that there must once have been at least nine. Moreover, the spacing of their bases on the site suggests that there might have been up to sixteen originally. Stylistically, the Delos lions, distinguished by their thin and elongated bodies and their detailed and muscular limbs, most likely belong to the first half of the sixth century BC, between 580 and 550 BC. This is a period when embellishments to the Delian sanctuary were dominated by Naxos, and indeed the lions are made of Naxian marble. 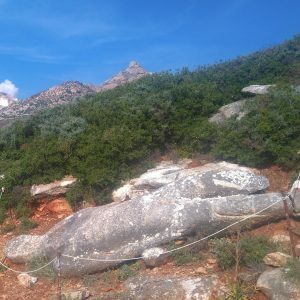 Thus, they belong to an era when the largest Cycladic island state was a leading force and was able to project its wealth, power and reputation by placing prominent monuments at important sacred sites: especially Delos in the Cyclades and Delphi in the mainland of Greece. There is no other such row of animal sculptures in early Greek art; perhaps the Naxian donors took the idea from the rows of sphinxes found in Egyptian sanctuaries, or maybe they themselves came up with the idea of repeating a figure for the sake of monumentality. What do the Naxian lions on Delos mean? We have no truly compelling idea. Perhaps they are symbolically guarding the area of the Sacred lake, one of the holiest parts of the site. Lions are not especially associated with Apollo, but they do sometimes occur in conjunction with his sister, Artemis. It is also possible that they lined and thus monumentalised an avenue or a processional route, although it does not appear entirely clear from where to where: most probably it would have connected the central shrine and altar of Apollo, to the south, with another spot further north. We do not even know what the general symbolic meaning of lions was: they are common enough in Archaic art, first here, later also in Athens and elsewhere, and in spite of the fact that lions did not exist in Greece at the time. In all likelihood, they stand for ideas of power and violence, but we cannot say more. In other words, the Delos lions are an enduring mystery, a point of wonderment and fascination in a place that is full of intriguing stories and beautiful sights to behold. In the afternoon, we continued to Paros, where we will explore great things tomorrow.